By Rocky C. Saenz, D.O. Imaging characterization of liver lesions is of diagnostic importance with regard to its implications on patient treatment. Utilization of dynamic MRI has become a common practice as an adjunct to dynamic CT scanning. With the recent FDA approval of gadoxetic disodium, this provides another avenue for evaluation and characterization of indeterminate liver lesions. 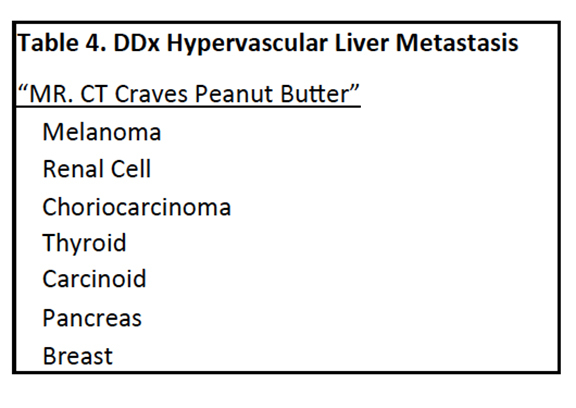 Gadoxetic acid was approved for use in the United States by the FDA in 2008 for detection and characterization of liver lesions in adults with known or suspected focal liver disease1 The purpose of this article is to review the imaging findings utilizing gadoxetic disodium with respect to benign liver lesions and metastatic disease. The advantage of utilizing gadoxetate disodium comes from its added hepatocyte phase intracellular imaging. The prior standard gadolinium agents only provide extracellular information with regards to indeterminate liver lesions. Gadoxetic disodium with its additional hepatocyte phase has the ability to provide more specific information of the hepatocyte function/content of an indeterminate liver lesion. Gadoxetate disodium is best utilized with dynamic, gradient echo (GRE) T1 fat saturation imaging. Optimally, arterial phase imaging, portal venous imaging, and delayed imaging at 20 minutes should be performed. Typically, liver lesions without hepatocytes will not accumulate gadoxetate disodium on delayed imaging. Therefore, they are hypointense relative to the native liver parenchyma on the hepatocyte phase. Since nearly all malignancies lack functioning hepatocytes, they will typically be hypointense on the hepatocyte phase. 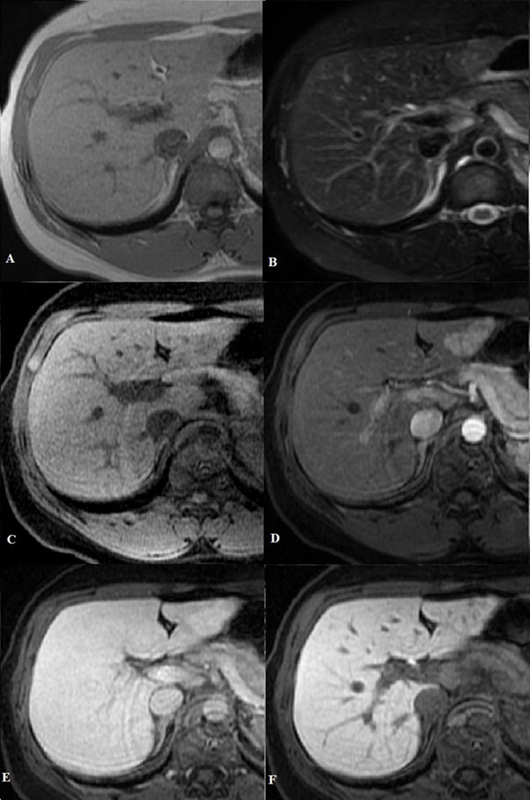 The one exception to this rule is well-differentiated hepatocellular carcinoma, which demonstrates enhancement on the hepatocyte phase secondary to residual functioning hepatocytes.4-5 Pre-contrast imaging with T1-weighted, T2-weighted, and in-phase and out-of-phase imaging are also beneficial in characterizing liver lesions. 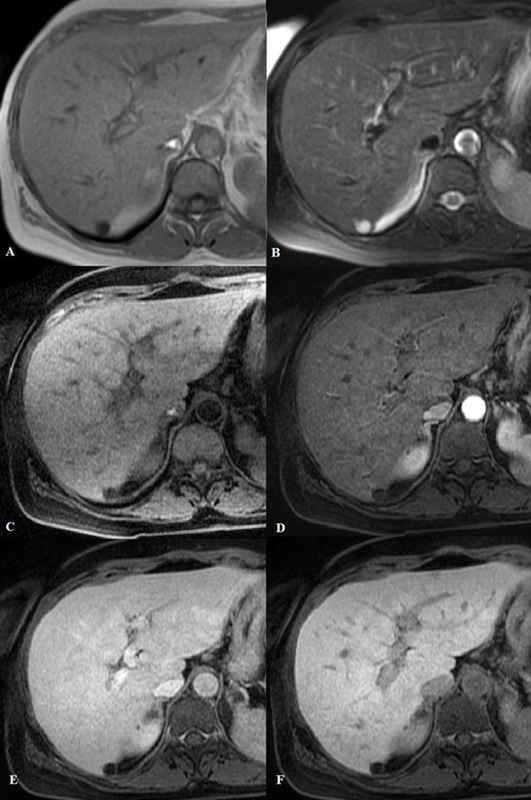 Hepatic cysts are seen routinely on diagnostic imaging studies and usually do not pose a diagnostic dilemma. Histologically, hepatic cysts are derived from biliary endothelium and contain serous fluid lined by a single layer of epithelium.6 These benign lesions are more commonly seen in women and may be multiple in number. Entities such as autosomal dominant polycystic kidney disease or tuberous sclerosis have been known to present with innumerable hepatic cysts. Hemangiomas are rarely associated with complications, such as spontaneous rupture/ hemorrhage;6 therefore, they are usually asymptomatic. Symptomatic lesions are usually very large (>10cm usually termed giant hemangiomas) and rarely may be associated with platelet sequestration, resulting in thrombocytopenia, known as Kasabach-Merritt syndrome.8-9 Large hemangiomas may also have a central scar, which represents fibrosis secondary to an area of central necrosis produced when the tumor outgrows its blood supply. Since hemangiomas are commonly encountered, radiologists must recognize their imaging features in order to preclude unnecessary workup or invasive procedures. Many lesions are diagnosed via dynamic liver CT based upon their enhancement patterns. Three dominant enhancement patterns have been described in the literature. The most common pattern is centripetal, peripheral, nodular enhancement of the lesion on early phases (arterial and portal venous phases).3 The enhancement progressively fills the lesion, resulting in iso- to slightly hyperattenuating compared to liver parenchyma on delayed imaging. This enhancement pattern typically occurs in hemangiomas 2-5 cm in size. Once lesions become larger, a similar enhancement pattern is seen; however, centripetal, peripheral, nodular enhancement of the lesion remains discontinuous centrally. This may occur secondary to the large size of the lesion or be related to central scar formation. Therefore, the lesion centrally remains hypoattenuated compared to surrounding liver parenchyma on delayed imaging. The final enhancement pattern usually occurs in small lesions (<2 cm in size). This enhancement pattern has been termed "flash-filling".3 These lesions typically enhance homogeneously between the arterial and early portal venous phases, resulting in increased attenuation compared to the surrounding liver parenchyma. These smaller hemangiomas also characteristically become iso-attenuated to liver on delayed imaging. 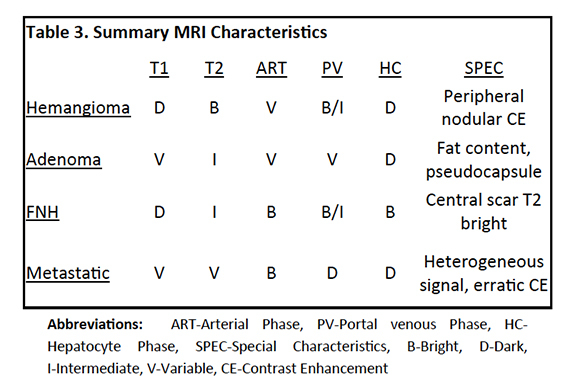 The MRI characteristics of hemangiomas are well documented. The lesions typically are hypointense on T1 and hyperintense on T2 compared to liver parenchyma. Classically, the lesions are hyperintense, almost "light bulb" bright on T2-weighted imaging. This feature helps distinguish them from malignant lesions, which are typically of intermediate signal on T2 imaging. The dynamic enhancement pattern on MRI with gadolinium agents is similar to the CT pattern just described. By utilizing gadoxetate acid, hemangiomas are hypointense on the hepatocyte phase, since they do not contain hepatocytes (Fig 2). Hepatocellular adenoma is an uncommon benign liver lesion which occurs predominantly in women of reproductive age.6 A direct association has been made with the use of oral contraceptives and steroids.3,6,7,10 Histologically, adenomas are made up of benign hepatocytes arranged in cords separated by dilated sinusoids.7 They lack bile ducts, which histologically distinguishes them from focal nodular hyperplasia (FNH).6,7 These histologic qualities are responsible for the dynamic enhancement pattern seen on imaging. 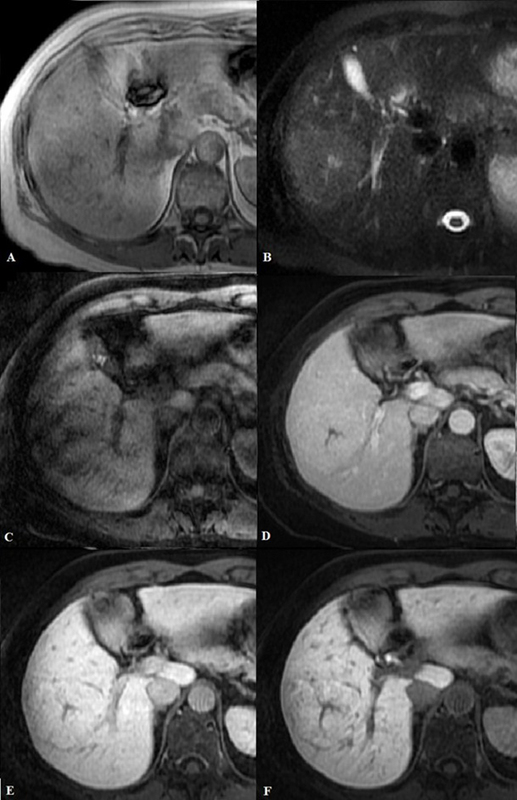 Hepatocellular adenomas also lack portal tracks and hepatic veins, which predisposes them to development of necrosis and rupture with spontaneous hemorrhage.6 There is also the potential for malignant degeneration with approximately 5% of adenomas differentiating into hepatocellular carcinoma.3 Since the severity of potential complications exists, adenomas are managed differently from other benign liver masses with the majority surgically removed. Therefore, it is important for radiologists to understand and recognize their imaging appearance. 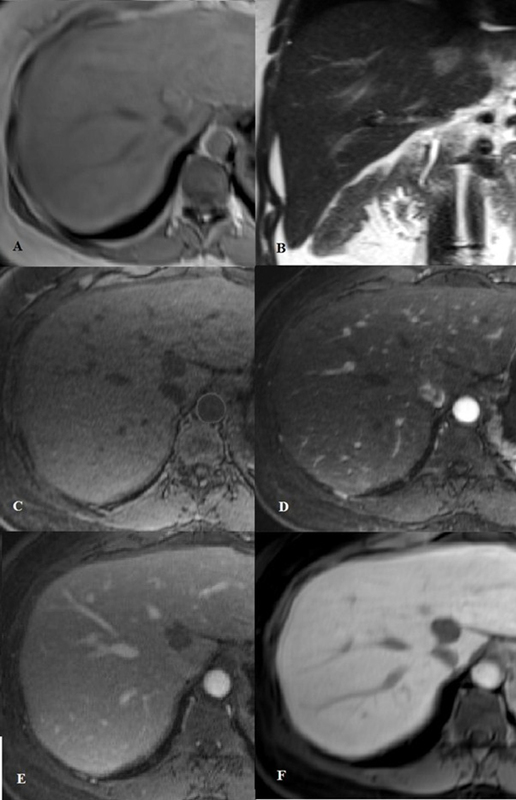 The MRI characteristics of hepatocellular adenomas may be variable. Typically, these lesions are hypointense to liver parenchyma on T1 and intermediate to hyperintense compared to liver parenchyma on T2 weighted images. On occasion, macroscopic fat may be present, which results in areas of high T1 signal intensity (Fig. 3). The dynamic MRI enhancement pattern is variable as well; typically, these lesions demonstrate homogeneous, hyperintense enhancement on arterial phase imaging, similar to other hepatic lesions (Table 1).10 Hepatocellular adenomas demonstrate this enhancement pattern secondary to their vascular histology. They typically remain hyperintense to iso-intense to liver parenchyma on portal venous imaging. The hepatocyte phase characteristics are a helpful discriminator with regard to diagnosis of these lesions, as adenomas are usually hypointense compared to liver parenchyma (Fig. 3). The gadoxetate acid hepatocyte phase is instrumental in differentiating these lesions from focal nodular hyperplasia, which is typically hyperintense to iso-intense to liver parenchyma.10 Lastly, an additional potential discriminating characteristic of adenomas is peripheral rim enhancement of the pseudocapsule. On MRI, FNH is typically of low signal on T1-weighted imaging and intermediate signal on T2-weighted imaging. Greater than 50% of these lesions demonstrate a central scar, which classically is of high T2 signal. Morphologically, FNH can be differentiated from hepatocellular adenoma based upon the tumor margins. Hepatocellular adenoma is typically well circumscribed, whereas FNH has lobulated margins. Metastatic disease represents the most common malignant tumor of the liver. The most common primary tumors include lung, breast, colon, pancreas, and melanoma.6 The majority are multiple and vary in size as well as appearance.11 Classically, metastatic lesions are poorly circumscribed with erratic behavior on dynamic CT and MR liver studies. The majority of metastases have their vascular supply from the hepatic arteries secondary to neo-angiogenesis; therefore, they demonstrate early enhancement on arterial phase imaging. This early enhancement, however, is nonspecific. 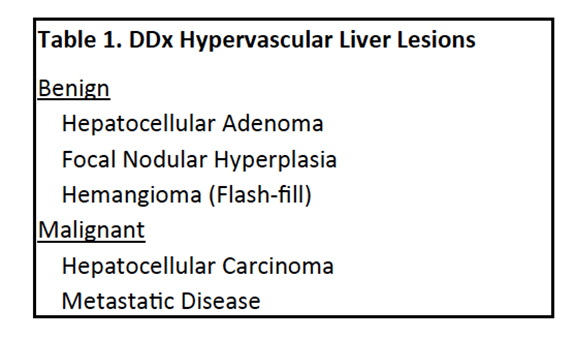 The differential diagnoses of hypervascular metastatic lesions are listed in Table 4. Unlike some of the benign entities previously discussed, metastases typically do not demonstrate homogeneous enhancement. Lesions from breast carcinoma and gastrointestinal adenocarcinoma may have a “target” enhancement pattern on arterial and early portal venous imaging (Fig. 6). Most metastatic lesions show “washout” on portal venous imaging (hypointense to liver parenchyma).11 Hepatocyte phase imaging demonstrates low signal intensity compared to surrounding liver parenchyma. Metastatic lesions demonstrate no enhancement on the intracellular 20 minute delayed phase, since they do not contain functioning hepatocytes (Fig. 7). It is imperative for the radiologist to be familiar with the different dynamic enhancement patterns of benign and malignant liver lesions. With the advent of gadoxetate disodium, hepatocyte phase specific imaging can provide important information in the characterization of indeterminate liver lesions. This additional information not only assists in making the correct diagnosis, but also helps guide management, to include avoiding unnecessary follow-up or invasive procedures in some cases. Bayer HealthCare Pharmaceuticlas website. http:// bayerimaging.com/products/eovist/index.php. Accessed March 6, 2012. Eovist Product Monograph. Bayer Inc, Wayne, NJ. http:// berlex.bayerhealthcare.com/html/products/pi/Eovist_PI.pdf. Revised Novemeber, 2011. Accessed March 6, 2012. Ringe KI, Husarik DB, Sirlin CB, et al. 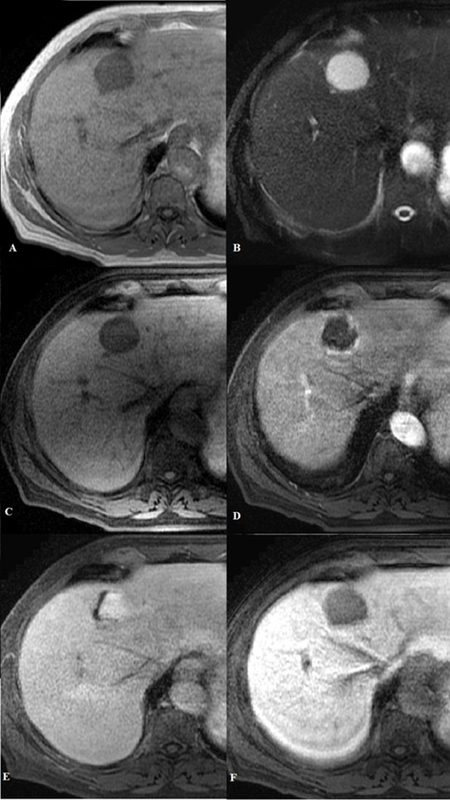 Gadoxetate Disodium Enhanced MRI of the Liver: Part 1, Protocol Optimization and Lesion Appearance in the Noncirrhotic Liver. AJR 2010;195:13-28. Jin-Young Choi JY, Kim MJ, Young NP, et al. 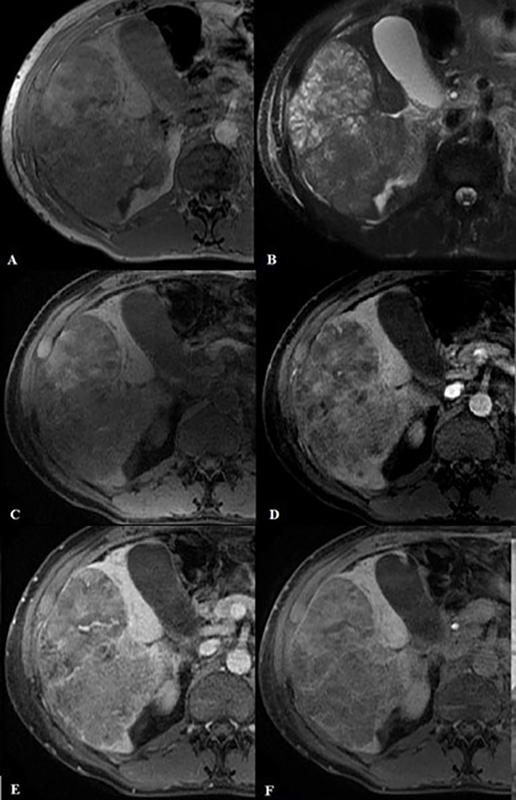 Gadoxetate Disodium-Enhanced Hepatobiliary Phase MRI of Hepatocellular Carcinoma: Correlation With Histological Characteristics. AJR 2011;197:399-405. Andrei S. Purysko AS, Remer EM, Coppa CP, et al. 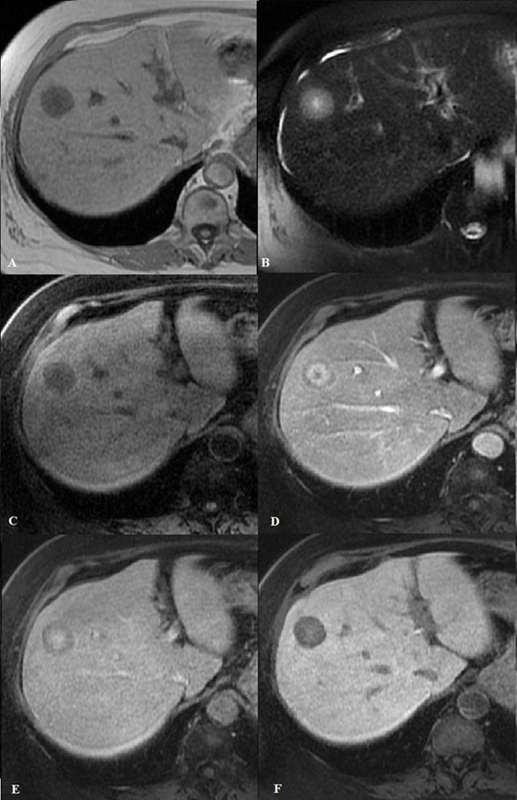 Characteristics and Distinguishing Features of Hepatocellular Adenoma and Focal Nodular Hyperplasia on Gadoxetate Disodium-Enhanced MRI. AJR 2012;198:115-123. Kamel IR and Bluemke DA. MR imaging of liver tumors. Radiol Clin N Am 2003; 41:51-65. Yuji Kumashiro Y, Kasahara M, Nomoto K, et al. Living Donor Liver Transplantation for Giant Hepatic Hemangioma with Kasabach-Merrit syndrome With a Posterior Segment Graft. Liver Transplnt 2002;8:721-724. Brizel HE and raccuglia G. Giant Hemangioma with Thrombocytopenia Radioisotopic Demonstration of Platelet Sequestration. Blood 1965;26:751-756. Grazioli L, Bondioni MP, Haradome H , et al. Hepatocellular Adenoma and Focal Nodular Hyperplasia: Value of Gadoxetic Acid-enhanced MR Imaging in Differential Diagnosis. Radiology 2012;262:520-529. Alvin C. Silva AC, Evans JM, McCullough AE, et al. MR Imaging of Hypervascular Liver Masses: A Review of Current Techniques. RadioGraphics 2009;29:385-402. Saenz R. MRI of Benign Liver Lesions and Metastatic Disease Characterization with Gadoxetate Disodium. J Am Osteopath Coll Radiol. 2012;1(4):2-9. Dr. Saenz works with the Department of Diagnostic Radiology, Botsford Hospital, Farmington Hills, MI.